The surge in the popularity and reach of women’s cycling in the UK in recent years has been driven by the successes achieved in the velodrome by riders like Victoria Pendelton. A new generation of female track cyclists repaid the investment from lottery funding by taking home several golds at the London 2012 Olympics. Sixty years ago a pair of pioneering women were achieving greatness in very different circumstances. A recent convert to the sport, perhaps inspired by the prominent results of a Cavendish or a Wiggins, could be forgiven for thinking that Britain has always been a hotbed of road racing talent. The opposite is true, mainly as a result of the long standing ‘ban’ imposed on mass start racing by the predecessor of today’s British Cycling. Ever the improvisers, the early cyclists with sporting desires found new ways to vent their need for competition. In the absence of a stage race or criterium, the staple of the continental rider came the race against the clock. Time Trialing remains a staple of the club riders calender, although the long distance record attempts belong to a much earlier era. In the age of lottery funding an athlete of potential might look forward to a lengthy sabbatical from the chosen profession without the anxiety of how to pay the bills. Many of the sportsmen and women competing in the events where Britain has become very successful (read Track Cycling) move seamlessly from education to competition without the need to consider a career elsewhere. This was not always the case. Outside of sports like football, becoming a professional in your chosen sporting pastime was an end to your chances of actually competing. This was certainly the case with cycle sport after the second world war and riders who were offered a professional contract needed to accept that they would earn their keep, at least within the UK outside of sanctioned competitions. 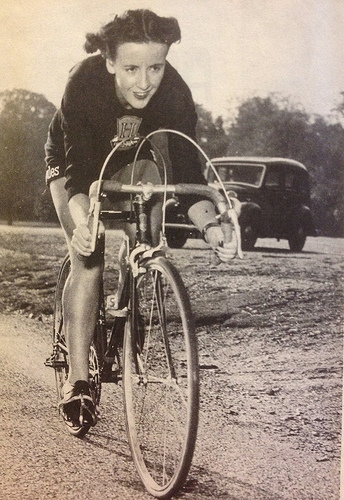 Eileen Sheridan was a successful time trialist or tester and track racer when, in 1951, she was approached by the Hercules cycle company about becoming a professional. She won her first national title in 1945, aged 21 and had taken several titles and records in the years that followed both against the clock and for a set distance. Hercules were something of a trendsetter, being the first British manufacturer to sponsor a professional men’s team as well as testers like Ken Joy. Unable to race in sanctioned events, Eileen Sheridan would target the long distance UK records in particular Lands End to John O’ Groats. She was not the first female professional to attempt this and not the first woman to ride professionally for Hercules. In fact Hercules had sponsored Marguerite Wilson to do in 1939 what they wanted Eileen Sheridan to do now and it would be Wilson’s Lands End John O’ Groats record that Sheridan would attempt to beat. Wilson’s own professional career was short lived, with war intervening in the Autumn to curtail further record breaking. It’s tempting to think that the Hercules board were just waiting for the emergence of another talented woman to allow them to pick up where they had left off. Certainly Eileen Sheridan had been thinking of the record. She preferred longer events and was a record holder for the ’12’, the amount of miles covered in a twelve hour period. Lands End to John O’Groats or LEJOG as it is shortened is the long distance place to place event that still resonates. It’s place within contemporary cycling is often as the epic route for a charitable cause. These rides generally allow a week to complete the distance and even this timescale represents a challenge for a seasoned rider. The record breakers look to achieve the distance in a little more than two days (women) and a little less than that (men). The time that Eileen Sheridan was attempting to beat in 1953 was Marguerite Wilson’s; two days and nearly twenty three hours for the 871 miles distance (LEJOG covers less distance now since the Forth Road bridge was not built when both attempts took place). Sheridan had beaten the record by a matter of minutes in 1952, but this was not recognised due to an arcane ruling banning publicity for an attempt prior to the start. Her equipment for the race was a Hercules badged lightweight as even her sponsor recognised that riding a stock machine would have put the diminutive Sheridan at a disadvantage. Running three gears only, she would have been unable to keep up with the pedals on a descent whilst climbing remained more of a push than a spin. The ratios were the same as Wilson had used years previously. With sports science in its infancy Sheridan, who had already experienced the perils of sleep deprivation prepared as well as she could. This involved a regime of hardening her contact points with surgical spirit, while breaking in saddles and riding shoes. Her diet would consist of chicken breasts, bananas and Ribena. The start was delayed as Sheridan and her support team waited for a favourable wind and weather forecast. As things turned out the forecast was wrong and she was battered by wind and rain within a few hours of leaving Lands End. By the end of the first day she was climbing the fearsome Shap Fell in Cumbria with over four hundred miles completed. Only now did she take a rest in the accompanying support caravan, for all of fifteen minutes. More than six hundred miles were down when she needed her lights for the second night of the attempt. Now tiredness had Sheridan in its grip. She needed to stop twice more in the next hundred miles and had snatched only twenty five minutes sleep when she was woken at 7.30am to get back on the bike. She was going to complete the ride on another bike, with a slightly lower gear to help her over the hills to come. This was the slightest concession, fatigue was now forcing her to walk her bike over the steeper climbs. Eileen Sheridan arrived at the John O’Groats hotel around 9pm. She had completed the ride in two days, eleven hours and seven minutes*. This wasn’t the end of her ride though. In addition to setting the LEJOG record in ’39 Marguerite Wilson had continued and set the benchmark for 1,000 miles also. With less than two hours sleep Sheridan was back on her bike. The lack of rest caused her to hallucinate; she saw people she knew and talked to them and polar bears. By the morning there were local supporters to keep her going, singing songs and running beside her. Completely exhausted she fell off her bike with 4o miles to go. Her support team cut up her breakfast and fed her like a baby and needed to lift her back on. She rode the last few miles weaving uncontrollably and lapsing from laughter to tears. She arrived back at the hotel an hour into the third day of riding. It’s a testament to Eileen Sheridan’s achievement 60 years ago that the current record, set nearly 50 years later, is less than seven hours faster. Without seeking to diminish the mark set by L E A Taylor (also the mixed tandem record holder), what Sheridan achieved on a comparatively heavy steel bike (with three gears remember) was incredible. Hercules made the most of it portraying her as an ordinary Coventry housewife and mother, when she was anything but ordinary. What was true was that she was a professional and the record she had beaten belonged to another professional rider. That record (Wilson’s) had already been beaten before Eileen Sheridan beat it again and further. Ironically, it was another Coventry housewife and mother of two who lowered the time by four hours in 1953, just ahead of Sheridan’s attempt. Edith (Edie) Atkins was an amateur however, starting her racing career a year later than Sheridan and still racing aged 76 in time trials. She was killed on her bike in 1999. Britain’s next female cycling star arrived at the start of the sixties, although Beryl Burton won her first significant award a year after Sheridan retired as a professional in 1956. VCSE will cover Beryl’s story in the future. The writer who brought the story to life for VCSE in his own memoir ‘One more kilometre and we’re in the showers’ is Tim Hilton. The link to that book is available via our Facebook page (follow the link on the right hand side of the VCSE website). And finally, there’s a very short clip of Eileen Sheridan on the VCSE YouTube channel (follow the links on the right hand side of the page). Quote *killed on her bike in 1999* such a sad but fitting end to a seemingly cycling legend.